Charlotte’s center city, known as Uptown, is divided into four wards, spreading out from the intersection of Trade and Tryon Streets. After earlier efforts stalled, a push for Uptown residential living took hold in the late 1990s and the city started blooming. With an influx of new condo buildings Uptown became a true urban oasis rather, not just a place to work. Since then Charlotte has become a vibrant metropolitan city, known for easy navigation and a clean, crisp feeling. Filled with exciting urban nights spots, multiple museums, bustling theater and art exhibitions, this Southern Lady has come to life. Now all four Wards are coming together, flowing seamlessly from one to another with an unbelievable amount of carefree upscale residential condo towers coming online in the next few years, along with more shopping, entertainment and dining venues. Sitting east of the intersection of Trade and Tryon, the First Ward is a neighborhood rich in both sports and cultural destinations. Home to Time Warner Cable Arena (where the Hornets and Checkers play) as well as the Blumenthal Performing Arts Center and Spirit Square, First Ward has something for everyone. The Lynx light rail terminates at 7th Street in the First Ward providing immediate access to the popular 7th Street Market and Levine Museum of the New South as well as the Center City Building, which houses the uptown campus of UNC Charlotte. Also known as “The Garden District,” residential options in the First Ward are as varied as the Ward itself, ranging from studio flats and lofts, to multi-level townhomes with roof-top decks, to single-family homes with grand porches and cozy gardens. Condos and townhomes define urban living in the First Ward, most featuring city views and within a few blocks of Time Warner Cable Arena. Expect to pay between $175 and $250 per square foot. Every now and then one of the First Ward’s few single-family homes becomes available with prices starting at $425,000. Stunning 2BR / 2BA 3-Story condo in Uptown Charlotte! This beautifully decorated home features an open floor plan with high ceilings and large windows for tons of natural light! Loaded with upgrades, hardwood floors, crown molding and custom paint! The Kitchen features granite countertops, stainless steel appliances, tile backsplash and a center island with breakfast bar! Top floor Master suite has a sitting area, walk-in closet and bath with large shower! Guest suite plus an office or den on the lower level. Granite countertops in both bathrooms! Surround sound speakers on the main floor! Private enclosed rear patio! 2 reserved end parking spaces! 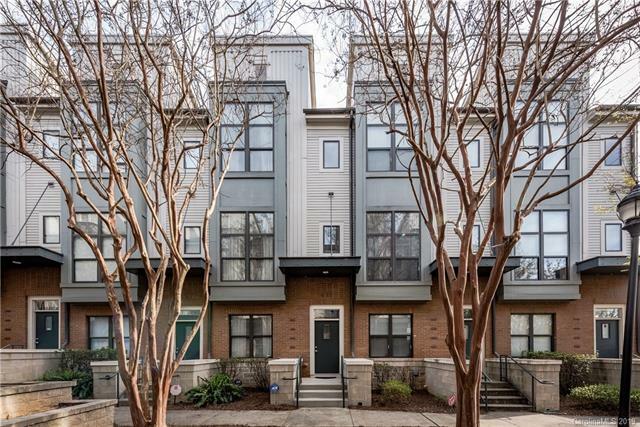 Convenient location near the light rail and walking distance to First Ward Park, Sugar Creek Greenway, Shopping, Restaurants, Nightlife and Pro-sports events! This gorgeous home is a must see! !